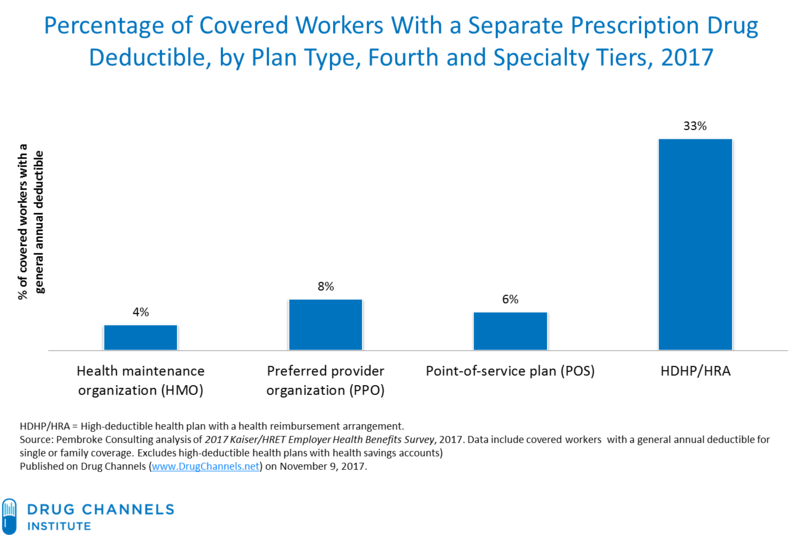 In a previous analysis (Employer Pharmacy Benefits in 2017: More Cost-Shifting to Patients As Tiers and Coinsurance Expand), I examined the structure of employers’ 2017 pharmacy benefit plans. Today, I examine the growing role of deductibles. The growth of separate prescription deductibles has become a significant change in patient cost sharing for prescription drugs. For 2017, about 8 out of 10 U.S. workers must meet a general annual deductible before their plan pays for most healthcare services. Prescriptions are typically excluded from the deductible. However, this year’s survey shows that one-third of workers in high-deductible plans now faces a separate prescription drug deductible. These plans shift 100% of the prescription cost to the patient until the deductible is met. After reviewing the latest data, I offer some observations on how deductibles are altering the pharmaceutical and pharmacy industries. The bottom line: Patients who must cover the costs of their drugs shop for better deals and cheaper pharmacies. 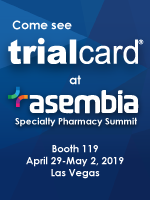 Get ready for the consumerization of the pharmacy industry! I again rely on data from Kaiser/HRET 2017 Employer Health Benefits Survey, which I reviewed in Employer Pharmacy Benefits in 2017: More Cost-Shifting to Patients As Tiers and Coinsurance Expand. Employers continue to expand the use of general annual deductibles. For 2017, 81% of covered workers have a general annual deductible that must be met before their health plan will pay for most services. The average deductible amount is $1,505 for single coverage and $4,527 for family coverage. The average deductible is higher in small firms than in large firms. See Section 7 for full details on deductibles. As I note in the August Drug Channels news roundup, high-deductible health plans lower health costs by reducing utilization. But sometimes, valuable preventative services are used less frequently. 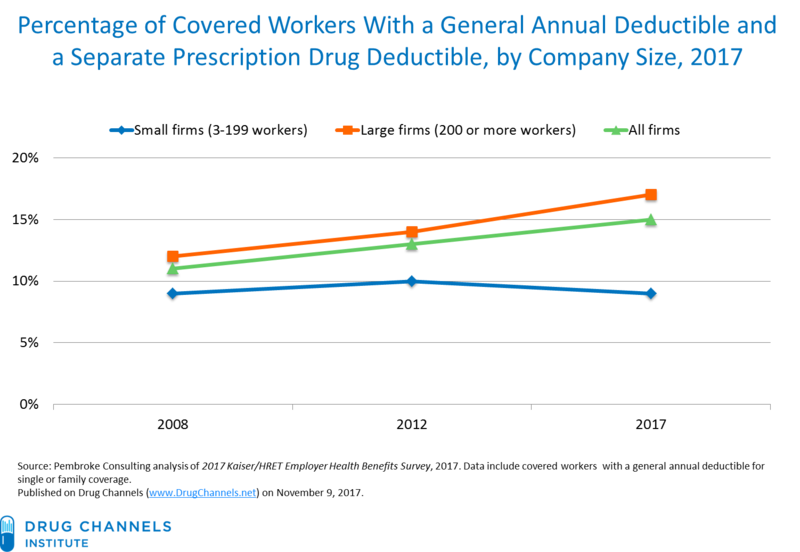 A growing share of workers with a general annual deductible are enrolled in health plans with a separate annual prescription drug deductible. A prescription drug deductible is separate from any general annual deductible. 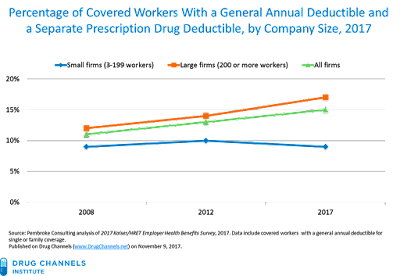 As the chart below shows, about one in seven workers (15%) now has a separate drug deductible. The growth has occurred at large firms. The 15% figure reflects an average across different types of health plans. 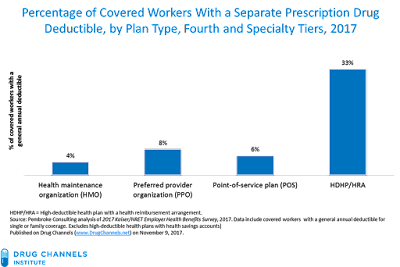 As the chart below shows, one-third of workers in high-deductible health plans face a separate prescription drug deductible. Enrollment in high-deductible plans is growing more quickly than enrollment in other plan types. Note that the Affordable Care Act mandates that for non-grandfathered commercial health plans, the maximum 2017 out-of-pocket limit is $7,150 for an individual plan and $14,300 for a family plan. This limit applies across both medical and pharmacy benefits. 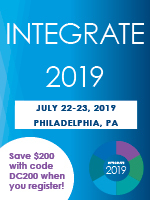 It does not have to include premiums, balance billing amounts for non-network providers and other out-of-network cost sharing, or spending for non-essential health benefits. BTW, deductibles are also common outside employer plans. For 2016, many individual plans that were offered via the health insurance marketplaces (HIMs) had a separate prescription drug deductible. Medicare Part D also has a deductible structure as part of its standard benefit, though most seniors have plans that do not have a deductible. See Chapter 6 of our 2017 Economic Report on U.S. Pharmacies and Pharmacy Benefit Managers. 1) Prescription dispensing is becoming more seasonal. Deductibles typically reset to zero on January 1, so patients have an incentive to fill more prescriptions in the fourth quarter, when they have reached the deductible threshold. Conversely, patients in deductible plans have higher abandonment rates and lower adherence levels than patients in standard plans. 2) Patients are increasingly exposed to the list price of their prescriptions. An especially controversial aspect of deductible plans arises for brand-name drugs with formulary rebates. Though patients pay the retail list price, their PBM and health plan can still collect a rebate that is not reflected in that retail pharmacy pricing. It’s an unfortunate consequence of the gross-to-net bubble that was highlighted by last year’s EpiPen outrage. 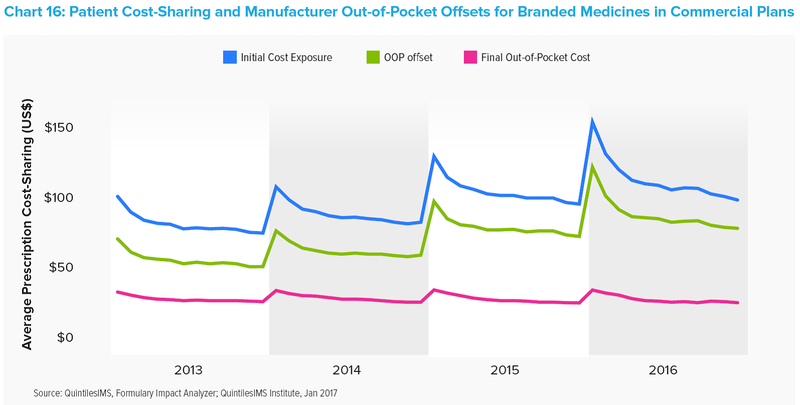 See EpiPen, Channel Economics, and the Great PBM Rebate Debate. 3) Consumers are starting to shop for prescriptions. For years, pharmacies were shielded from the forces of U.S. retail competition. The consumer’s out-of-pocket “price” has been identical at different pharmacies. Product selection remained in the hand of authorized prescribers and third-party payers. Consequently, pharmacies competed on service, convenience, and location to attract the consumers within a particular plan. 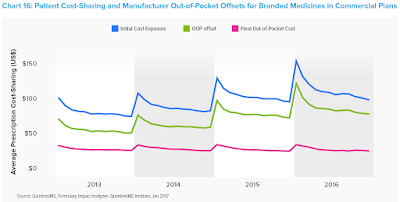 Since the consumer’s out-of-pocket costs were identical at all pharmacies, there were no financial incentives for a consumer with third-party coverage to shop at the pharmacy with the lowest cost per prescription for the payer and/or the patient. Compare pharmacy with other retail industries. In the 1980s and 90s, category-dominant power retailers emerged. They concentrated on one or more closely related merchandise lines. Examples included Toys R Us (toys), Petco (pet supplies), Staples (office supplies), and Home Depot (home improvement). They offered lower prices and broader selection to consumers and usually adopted a "buy direct" policy that bypassed wholesalers. Price competition led to a major shakeout of small retailers. Example: Toys R Us went from a 5% share of the toy market in the late 1970s to almost one-third of entire U.S. market by the mid-90s. Thousands of mom-and-pop toy stores closed. Of course, times have changed. More than 10 years ago, Walmart started retail pharmacy competition with its $4 generic programs. As far as I know, it was the first time that the price of a prescription was advertised directly to the consumer. The program was widely imitated by other retail chains. Many pharmacies, however, have discontinued or narrowed the scope of their programs. Narrow networks have somewhat accelerated shopping behavior, because payers partially expose consumers to the cost differences among pharmacies. A preferred or limited network causes the consumer some degree of inconvenience. However, consumers seem willing to shift pharmacies for even very small monetary rewards. Consider how quickly preferred network models have grown within the Medicare Part D program, as I show in Preferred Pharmacy Networks Will Dominate 2018 Medicare Part D Plans. That’s because seniors are simultaneously shopping for a plan and a pharmacy. I realize that pharmacy has a long way to go before it will be comparable with first-party payment for consumer goods. But the growing use of prescription drug deductibles directly encourages shopping behavior. Online discount card vendors such as GoodRx and Blink Health are benefiting from this trend. Consider generic drugs. They now account for nearly 90% of prescription dispensing activity. Yet there are still wide and persistent variations in cash prices for common, high volume generics. This phenomenon makes me wonder whether consumers are getting the true benefits of market competition among pharmacies. It’s also why I believe that fulfillment of low-cost generics would be the most logical place for Amazon to enter the market, per A Reality Check on Amazon’s Pharmacy Ambitions. Deductibles are not yet popular enough to trigger a true Black Swan event, a la Scott Gottlieb’s Radical Idea for Disrupting U.S. Drug Channels. But the growth trend for prescription drug deductibles is driving us in that direction. Perhaps one day we’ll even worry about prescription drug users with oniomania.